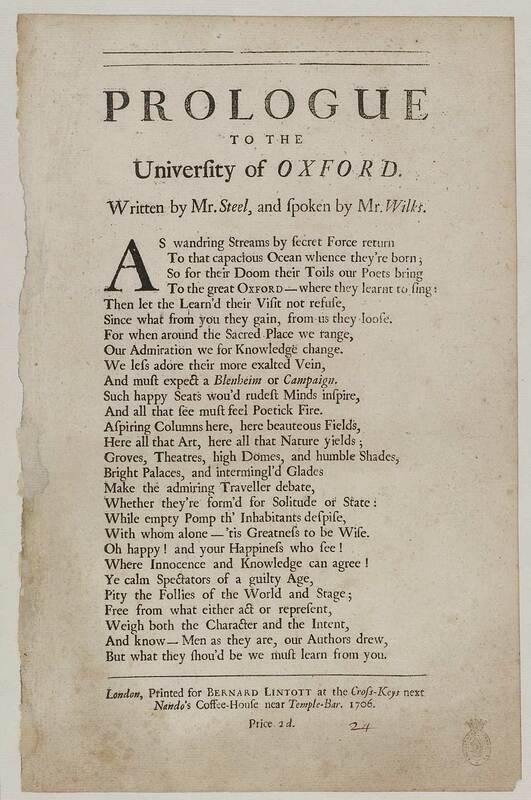 Written by Mr. Steel, and ſpoken by Mr.Wilks. Since what from you they gain, from us they looſe. Our Admiration we for Knowledge change. And muſt expect a Blenheim or Campaign. Such happy Seats wou'd rudeſt Minds inſpire. And all that ſee muſt feel Poetick Fire. With whom alone—'tis Greatneſs to be Wiſe. Oh happy ! and your Happineſs who ſee ! Where Innocence and Knowledge can agree ! But what they ſhou'd be we muſt learn from you. Nando's Coffee-Houſe near Temple-Bar. 1706. First line reads: As wandring streams by secret force return. In one column. Price 2d.